CEDAR CITY — The trailers of two separate trucks traveling southbound on Interstate 15 near Cedar City were flipped over as a result of the high winds that ripped through the Iron County region Monday afternoon. Utah Highway Patrol troopers were dispatched at 2:57 p.m. by the Cedar Communication Center to milepost 54, a few miles south of Cedar City, to assist with the first incident, said Trooper Bruce Fox. The Avalanche came to a stop in the emergency lane facing north, Fox said. Traffic was slowed briefly as a result, but was not stopped. The Salt Lake City area family in the Avalanche was traveling to Sand Hollow Reservoir in Washington County for family fun when the incident occurred, Fox said. Though the truck was fine, the trailer required towing services. At 3:37 p.m. another call came in to the Cedar Communication Center, sending Trooper Bambi Baie to a similar incident only 22 miles away. A couple from Washington City were traveling home in a 2014 GMC truck when the accident occurred. The male driver of the truck was towing an empty utility trailer and lost control of the trailer in the wind, Baie said. 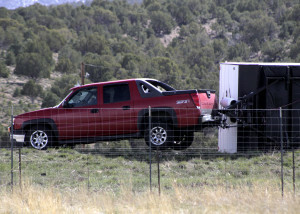 The GMC and trailer ended up on the shoulder embankment of I-15 at milepost 76 near Parowan. The trailer rolled even though the truck itself remained upright the entire time.